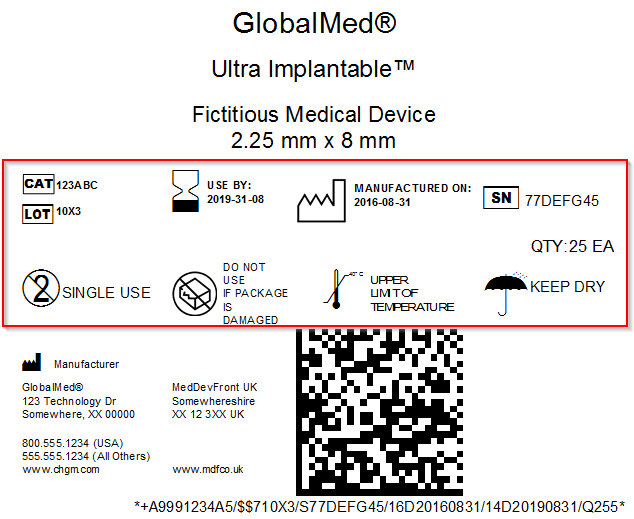 The HIBC (Health Industry Bar Code) standard is used to produce uniform data transfer for patient safety and unique device identification (UDI). 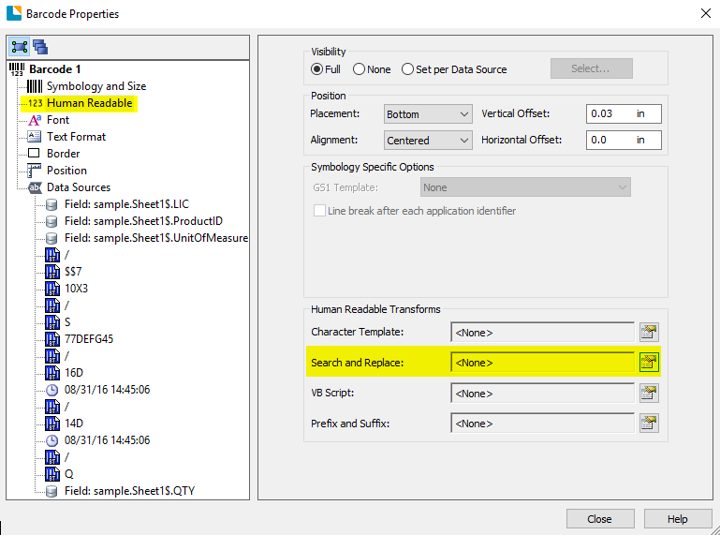 BarTender 2016 R3 has a sample document available that can be easily modified to meet your needs. The HIBC sample uses a 2D Datamatrix barcode symbology with concatenated Primary and Secondary data. If you choose to install the "Sample Documents" while installing the BarTender 2016 R3, then the sample document should be in Documents\BarTender\BarTender Documents\HIBC\Medical Device UDI - HIBC.btw. You may also download the sample document from the link below. The HIBC standard organizes barcode data by Primary data, required data for all products, and Secondary data, discretionary data applicable to the product. 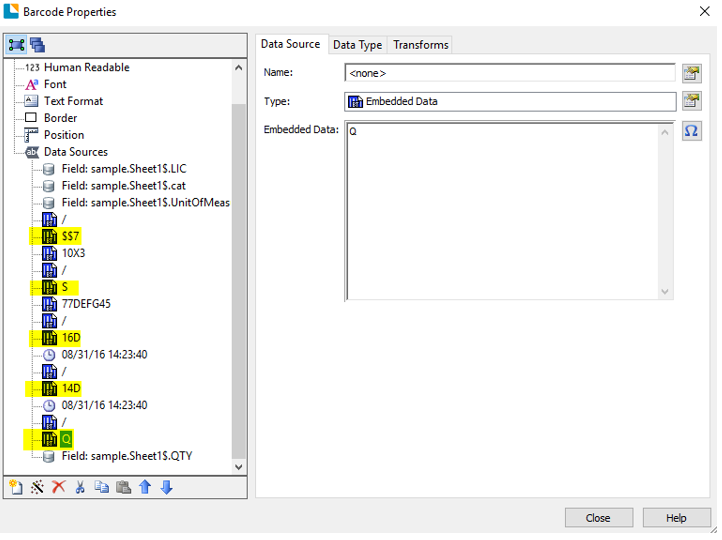 Additionally, some data elements vary in length and format, so data flags are used to prefix the data segments indicating the data element and format. Labels following the HIBC standard need to include the following information. Product/ Catalogue number - Assigned by the labeler. Identifies the item/drug/device. 1-18 alphanumeric characters. Unit of measure - Assigned by the labeler. Identifies the packaging configuration level of the item; e.g. Unit-Dose, Carton, Case, Master-Case, Pallet, etc. 1 numeric character. A single unit is always represented by 0. Check character – Mod43 check character calculated from Primary data characters. BarTender calculates it for you. Labels following the HIBC standard may include the following information as applicable to the product or device. Lot number - The lot number is alpha numeric and can be up to 18 characters. Serial number - The serial number is alpha numeric and can be up to 18 characters. Manufacture Date - If you are entering both the Manufacture and Expiration dates, then the Manufacture Date must be before the Expiration Date. Expiration Date - YYYYMMDD date format is the FDA required plain text format for UDI. However, you may use other formats within your bar code symbol. Quantity – The quantity is numeric. 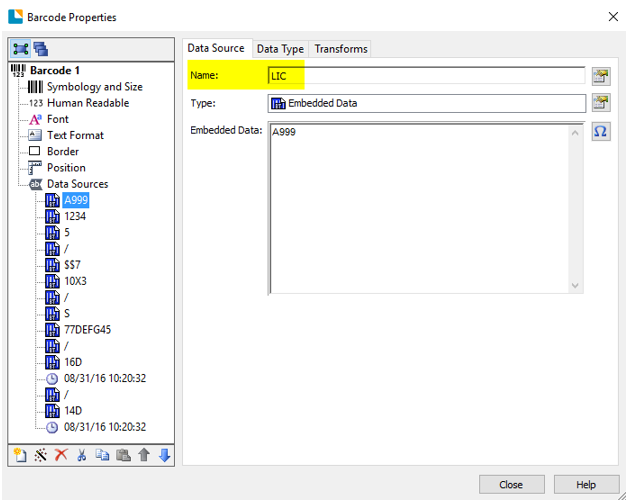 Link Character – Mod43 Check Character from Primary data. BarTender calculates it for you. 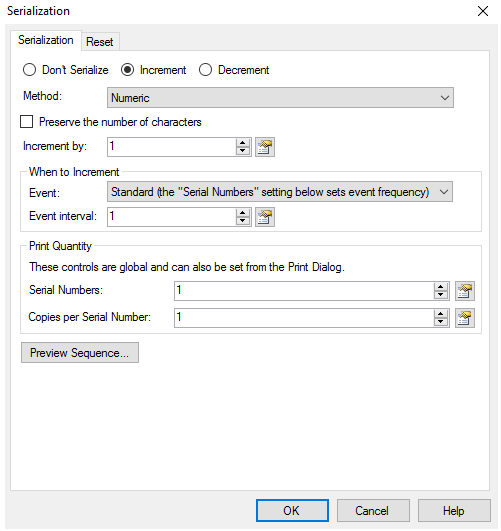 Check Character – Mod43 Check Character calculated from Secondary data characters. BarTender calculates it for you. If you have many products, then you may want to add your data to a database table or data file such as a CSV. You can connect the BarTender document to the database and print records as needed. You will separate out your data by element. Note: BarTender will calculate the MOD43 check digit, so it is not necessary to store the check digit(s) or link character(s) in the database. HIBC barcode data must be organized with the proper data flags indicating the data element and format of the data. The flags used will change depending on the combination of data elements and format of the data. You will need to gather the data flags for all the data combinations used by your products. Visit the official HIBCC website and use the formatter tool to gather your data flags. 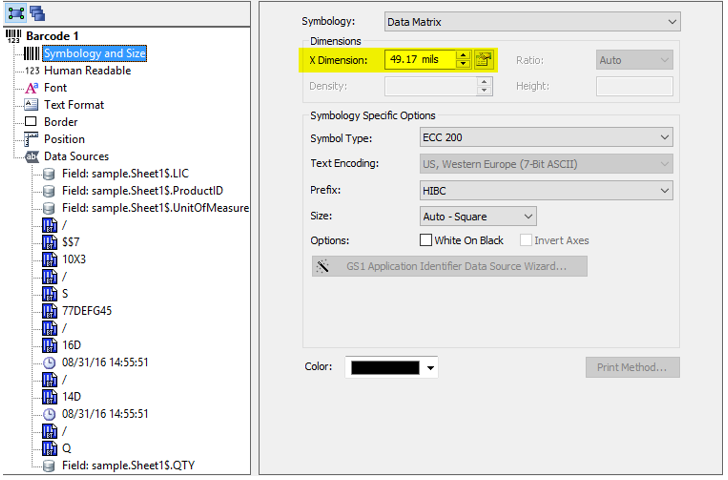 Alternatively, you may use the tables in the official HIBC labeling standards (spec sheet) to manually set up the data structure with the data flags. For example, note the data flags highlighted in red below. 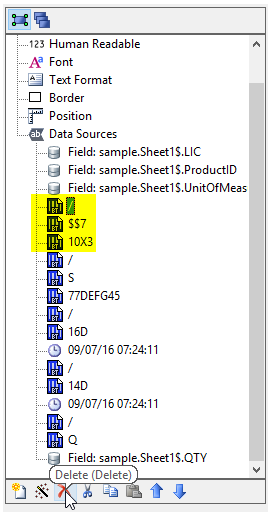 In Sample 3, the data flag for the serial number is “/S”, but in Sample 4 the data flag is /$$+7 even though the serial number is the same. The combination of data included caused the data flag to change. 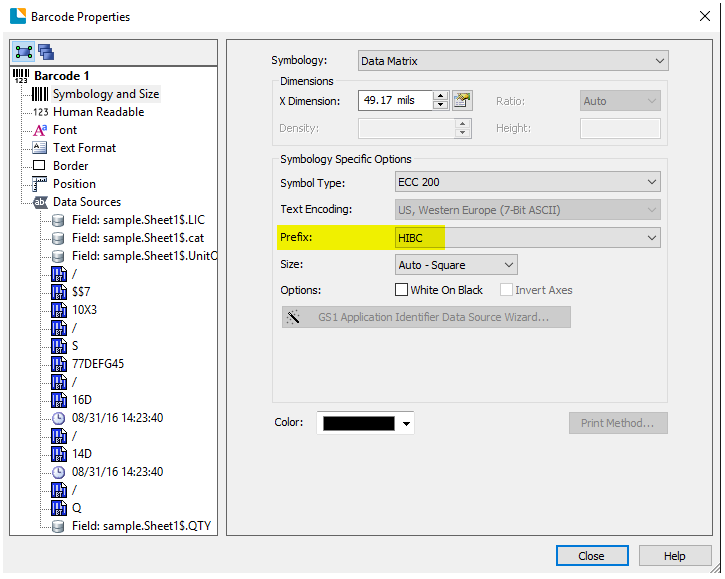 Once you have prepared your database (optional) and gathered your data flags you are ready to begin modifying the sample document into your own HIBC label. If you choose to install the "Sample Documents" while installing BarTender 2016 R3, then the sample document should be in Documents\BarTender\BarTender Documents\HIBC\Medical Device UDI - HIBC.btw. You may also download the sample document from the link below. 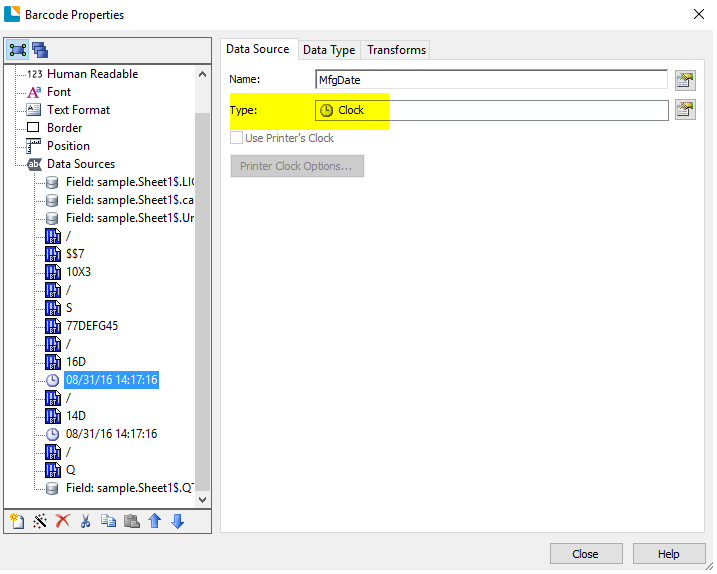 Before continuing you will want to set the document to the correct printer (File > Print), and adjust the page setup (File > Page Setup) to match your printer stock. Open the barcode properties to configure the HIBC barcode. You will notice that the barcode already has many data sources. The data sources are named, and already set in the barcode and text objects, so the data only needs to be set in the barcode, and the text objects will use the same data. Set the value for the Primary data sources: LIC, Catalog number/Product ID, and Unit of Measure. 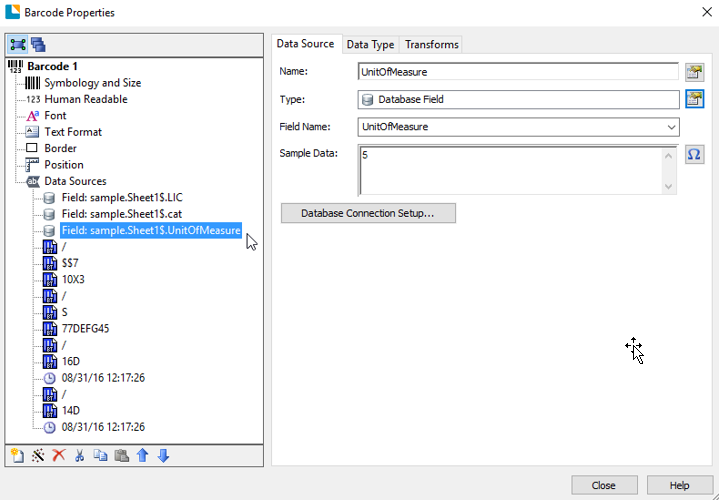 If the label is connected to your database, then you can link the data sources to the appropriate database field. 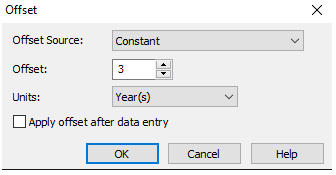 The manufacturing date may be a database field, be linked to a data entry form control, or use the current date. The manufacturing date may be a database field, be linked to a data entry form control, or use the current date. BarTender has an offset feature which can be used to add or subtract a specified amount of time from the data source. Visit the Offset Dialog page in BarTender help system for more information. Quantity is not a field that is recognized by the FDA for UDI. However, it has always been an optional component in the HIBC standard. 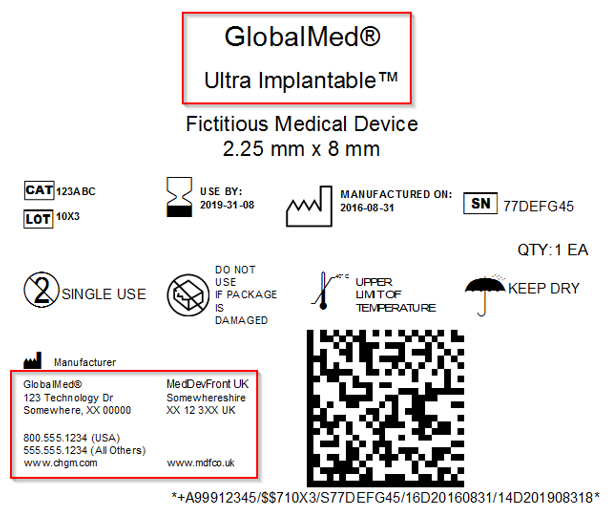 According to the FDA, they will accept additional non-UDI fields in the barcode as long as they appear at the end of the data string. To add Quantity to the end of you data stream, you will need to add three more data sources to the barcode: the data separator, the data flag, and the Quantity. 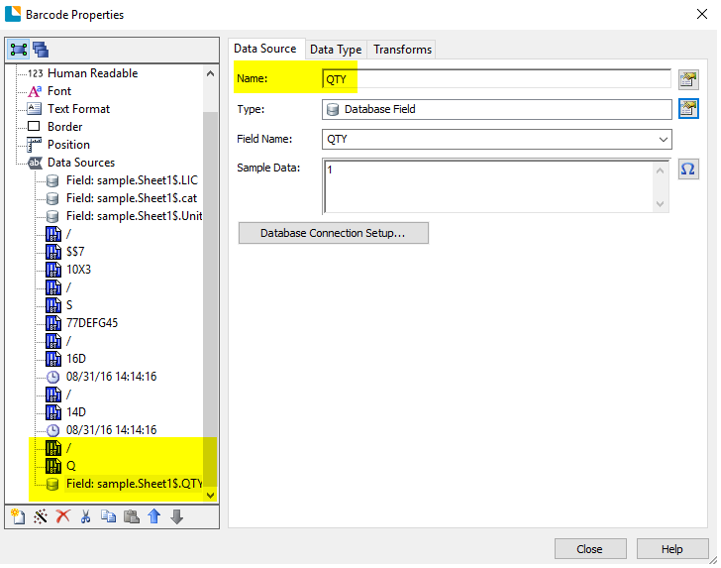 Set the Quantity data source name to QTY so it links with the other quantity elements on the label. 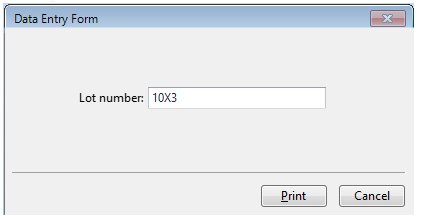 The Quantity may be a database field, or linked to a data entry form control for user input at print time. Using the data flags gathered earlier, set them as the embedded data for each of the data segments. 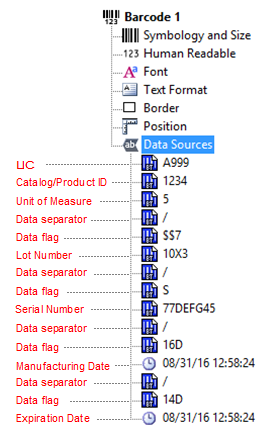 If your product doesn’t use a certain data element, such as Lot number, then you will want to delete the Lot number data source and its associated data separator and data flag. BarTender will automatically calculate the Modulo43 check digit, add the + Primary data flag, and wrap the human readable text with * when HIBC is selected as the prefix. When the check digit is a space, HIBC recommends displaying it as and underscore in the human readable (not in the barcode). 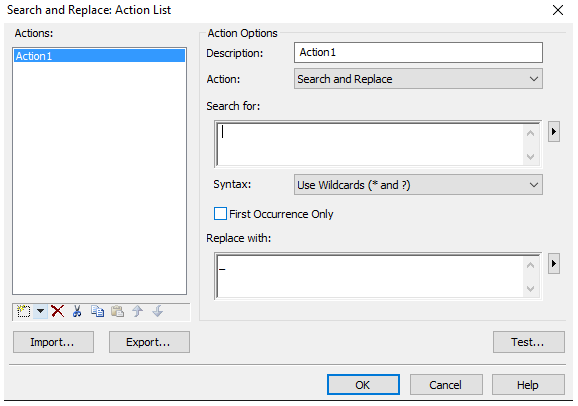 Apply a Search and Replace action to the human readable to display a space as an underscore. You may need to adjust the size of the barcode to fit your label. The barcode is now configured. Set the static data relevant to the product, such as Manufacturer name, contact info, and trademarks. The Primary and Secondary data elements should also be labeled with text and the associated FDA symbol. You are now done adding the data to your label and can arrange the objects’ positions and sizes to meet your needs. Once finished you can save the document and get right into printing.